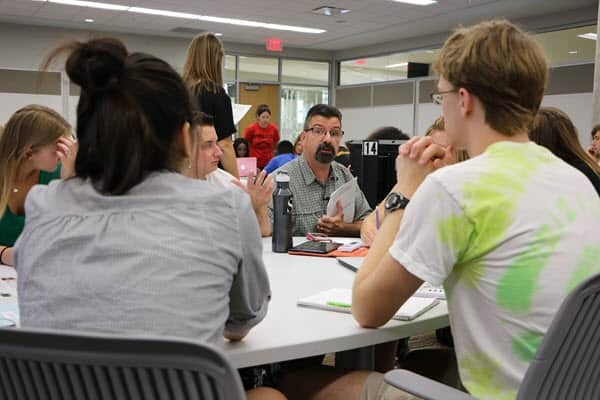 When Mark Mort began remaking a 100-level biology course a few years ago, he asked instructors who had taught the class what they thought students needed. “Not surprisingly, the answers were very much content, content, content,” said Mort, an associate professor of ecology and evolutionary biology. Then he went to colleagues who taught classes later in the curriculum, courses for which his course, Biology 152, was a prerequisite. He asked what they expected students to know after taking Biology 152, or Principles of Organismal Biology. The response was both sobering and liberating, reminding Mort of the course’s weaknesses but helping justify a major remake. Biology 152 is the first of a two-course sequence that most biology majors take. It had long been taught as a lecture to 400 or more students, with instructors using PowerPoint slides to “plow through as much material and content as possible,” Mort said. Mort knew the course had problems. “We were losing a lot of students because we were trying cover a lot of material in a very rapid fashion,” he said. All too often, Mort said, faculty members get lost in the content and forget about the things that fascinated and inspired them early in their careers. “And I think if we don’t step back and say, ‘This is why I’m a biologist’ or ‘This is why I’m a psychologist,’ we don’t get the excitement in the next generation of students,” Mort said. The transformation is working. Students are more engaged. The number of those who drop or fail has declined. Instructors are enjoying the teaching of the class more. And Mort is able to have new conversations with his colleagues. In other words, it’s no longer all about the content. Tagged active learning, course transformation.